“There has been increasing speculation that the United Kingdom’s departure from the European Union on 29 March could eventually lead to the unification of the Republic and Northern Ireland,” TheJournal.ie said in reporting a national poll showing a narrow plurality of Irish people favor holding a referendum on the issue. A car bomb in Derry , Northern Ireland, was attributed to an attack by the New IRA, said to be “just one of a number of dissident republican groupings,” according to The Irish Times. Four people have been arrested. Irish Taoiseach Leo Varadkar told the World Economic Forum in Davos, Switzerland, that Ireland has “closed down” tax loopholes and is bringing in more corporation tax as a result, TheJournal.ie reported. Salesforce announced the expansion of 1,500 staff over the next five years; and Facebook said it would add 1,000 jobs this year, the American Chamber of Commerce Ireland announced. “My job in this country as I see it is to tell Ireland’s story – and to listen to America’s story – and to connect the two stories,” Irish Ambassador to the United States Dan Muhall said in a USA Today profile. Israel warned Ireland that a boycott of imported West Bank settlement products would have “severe ramifications” on mutual relations if the proposed Dáil legislation is adopted. The administration has opposed the legislation and warned that it contravenes E.U. law and puts U.S. investment in Ireland at risk. The New York Times reported “Irish women are now discovering the mere passage of a law [last May, repealing national abortion restrictions] cannot wipe away deeply held beliefs” and that pro-life activists are using “United States-style tactics like fake abortion clinics and protests outside legitimate ones” to thwart the now-legal procedure. 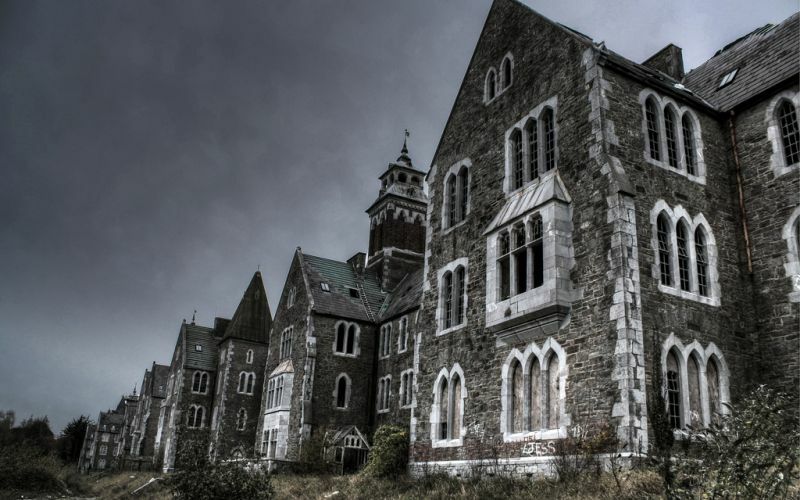 An Taisce, the National Trust for Ireland, published a first-ever list of the country’s Top 10 Most-at-Risk Buildings. (The buildings-at-risk project is not new.) “These are all buildings of national importance, buildings that lie vacant and are in such a state of disrepair that they may be dangerous or have no identifiable new use,” the agency says. This entry was posted in Arts & Culture, Business & Environment, Irish America, Northern Ireland, Politics and tagged An Taisce, Brexit, Dan Mulhall, IRA, Leo Varadkar, United Ireland on January 30, 2019 by admin. Northern Ireland would be better off financially as part of a united Ireland, according to the “Northern Ireland’s Income and Expenditure in a Reunification Scenario” report by Gunther Thurmann, who worked on the German desk at the International Monteary Fund during German reunification, and Fianna Fail Senator Mark Daly. The new report includes the December 2016 analysis by the U.S. House of Representatives Congressional Research Office, requested by Congressman Brendan Boyle (D-Pa.), in the wake of the Brexit vote. “There’s no such thing as Irish science; there’s only global science.” — Mark Ferguson, director general of Science Foundation Ireland, at a 25 July, Irish Network-DC event at the Embassy of Ireland, Washington, D.C. SFI was created by a 1998 government initiative and has put Ireland at the forefront of scientific research and development. Ferguson said he sees new opportunities for Ireland resulting from Brexit. In a reflection of the diversity of modern Ireland, a new graveyard for all denominations – and for none – opened in Killarney, County Kerry, The Irish Times reported. A previously undiscovered henge, or circular enclosure, close to the neolithic passage tomb Newgrange, was spotted by an historian flying a drone over the Boyne Valley, County Meath. Unusually dry weather caused the outlines of the site to emerge like subterranean shadows. Friday, 27 July, offered a night of stargazing in Ireland, with a total lunar eclipse, a “blood moon,” and rare looks at Mars, Jupiter and the International Space Station. The touring “Coming Home: Art & The Great Hunger” exhibit from Ireland’s Great Hunger Museum at Quinnipiac University in Hamden, Conn., opened this month in Skibbereen, County Cork, where it will remain through 13 October. The exhibit opened in Dublin earlier this year. It will show in Derry, Northern Ireland, the first quarter of 2019. 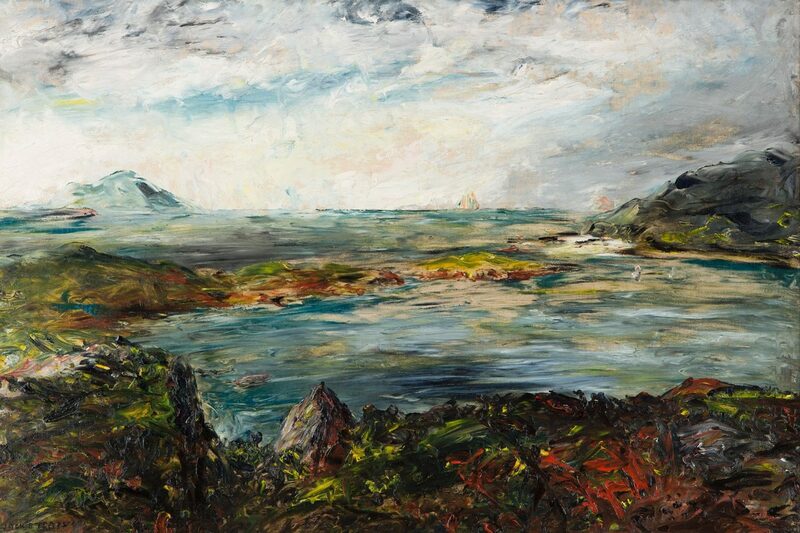 “Derrynane,” a 1927 oil on canvas by Jack B. Yeats, is part of the “Coming Home” exhibit. This entry was posted in Arts & Culture, Business & Environment, Irish America, Northern Ireland, Politics, Religion and tagged Brexit, United Ireland on July 27, 2018 by admin. The first edition of Ireland Under Coercion was published in August 1888. The Preface of the second edition, quoted above, was dated 21 September 1888. Mixed reviews of the book appeared that autumn in Irish, English and American newspapers and literary journals. This was ironic. The review appeared weeks before a special judicial commission began investigating alleged crimes by Charles Stewart Parnell and other Irish nationalists, driven primarily by an 1887 Times series. Once the commission exposed those reports as false, included the newspaper’s use of forged letters, the Times had to pay damages to Parnell. In his book, Hurlbert had accused the parish priest of organizing boycott activities at Miltown Malbay, based on his February 1888 visit to County Clare. In Hurlbert unmasked, Father White disputed the charge, and criticized the American reporter on numerous other fronts. 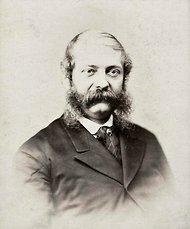 The New York Sun noted that Father White ridiculed the former editor of the rival New York World “as a snob who made his tour of Ireland under the conduct and patronage of lords and others of social and Tory distinction, and who is scrupulous and persistent in advertising the fact.” Following the priest’s lead, the Sun also criticized Hurlbert’s use of unnamed sources. NOTES: Top quote from Preface of Ireland Under Coercion: The Diary of an American. Reviews from Times of London, Aug. 18, 1888, page 12; United Ireland, Aug. 25, 1888, page ?? ; The Kerry Evening Post , Aug. 25, 1888, page 2; The Saturday Review, Sept. 29, 1888, pages 386-387; IUC advertised in The Chicago Tribune, Dec. 1, 1888, page 13; The Brooklyn (New York) Daily Eagle, Nov. 25, 1888, page 7; The Literary World; a Monthly Review of Current Literature, Jan. 19, 1889; page 22; The New York Sun, Jan. 31, 1891, page 7; The New York Times, April 27, 1890, page 19. “Protestant interests and conservative politics,” from page 196-97 of Newspapers and Nationalism: The Irish Provincial Press, 1850-1892, by Marie-Louise Legg, Four Courts Press, Dublin, 1999. This entry was posted in Arts & Culture, History, IUC, Revisted, Journalism, Politics and tagged Charles Stewart Parnell, Father Patrick White, United Ireland, William Henry Hurlbert on June 9, 2018 by admin. 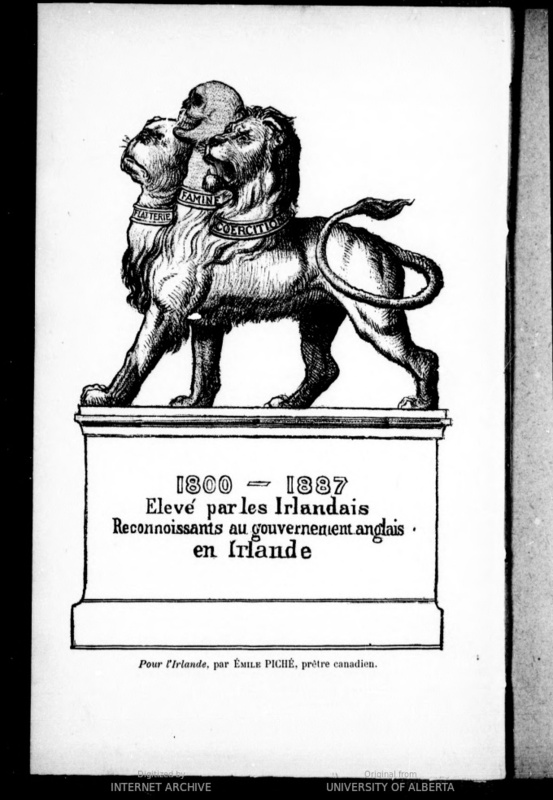 An earlier post in this series mentioned Hurlbert’s reference to French journalist Paschal Grousset’s 1887 newspaper dispatches from Ireland, which were collected into the book Ireland’s Disease, the English in Ireland. 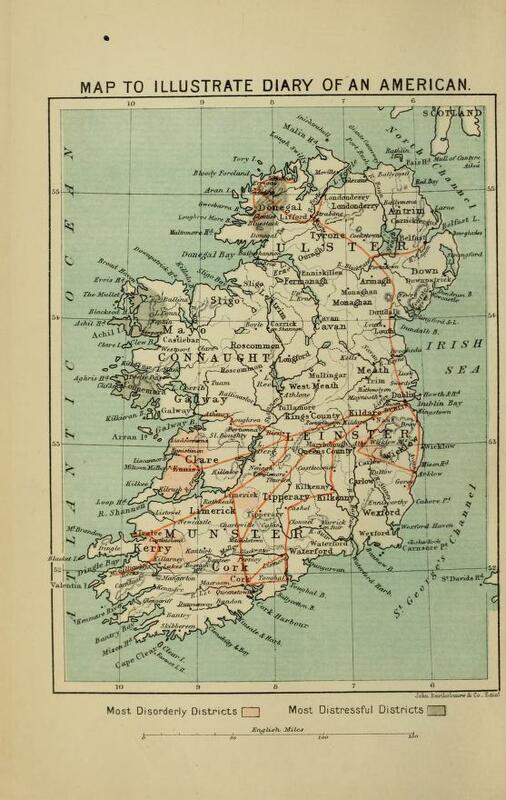 It was among numerous books published during the 1880s by visitors to Ireland, including Hurlbert’s Ireland Under Coercion. In a late February 1888 diary entry from Partumna, County Galway, Hurlbert discussed two other recently published books about Ireland, also both written in French: Chez Paddy (Paddy at Home), by Baron Edmond de Mandat-Grancey, and the rebuttal, Pour l’Irlande (For Ireland), by Emile Piché, a French-Canadian priest. The former book favored the conservative government in London, the latter title was sympathetic to Irish tenants. The year 1800 refers to the Act of Union, which dissolved the Irish parliament and created direct rule from London, which prompted the Home Rule efforts of the 1880s. The labeling of one of beast’s collars as “coercion” refers to government actions against the agrarian uprising. It is opposite of how Hurlbert used the word in his book’s title and throughout its text to refer to the tactics of the Land League and other agrarian activists against landlords and the government. More reviews and reactions to Hurlbert’s book in a future post. NOTES: From pages 249-252 of Ireland Under Coercion: The Diary of an American. … Times of London, 18 August 1888, and United Ireland, 25 August, 1888. This entry was posted in Arts & Culture, History, IUC, Revisted, Journalism and tagged "Chez Paddy", "Hurlbert unmasked", "Ireland’s Disease", "Pour l'Irlande", United Ireland on April 16, 2018 by admin. It focuses on what Ireland needs in the final Brexit agreement now being netotiated between the E.U. 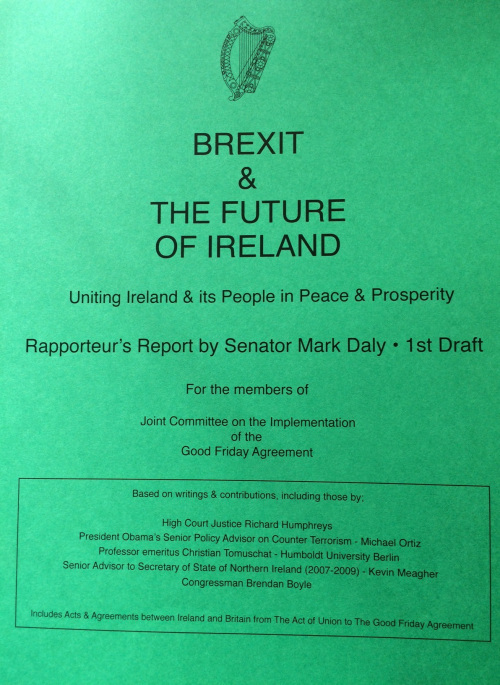 and the U.K., “particularly in the event of the people of Northern Ireland voting for a United Ireland and what Ireland needs to do in order to peacefully achieve its constitutional obligation.” The report outlines 18 recommendations. I’m still working my way through the report. I’ll come back with more. Of note for now, it includes a December 2016 analysis of Northern Ireland finances by the U.S. House of Representatives Congressional Research Office, starting on page 14. U.S. Congressman Brendan Boyle, a Pennsylvania Democrat, requested the analysis, which highlights “the difficulty in getting the accurate figures” about expenditures and revenue in the six counties. This entry was posted in Business & Environment, Northern Ireland, Politics and tagged Brexit, United Ireland on August 3, 2017 by admin. 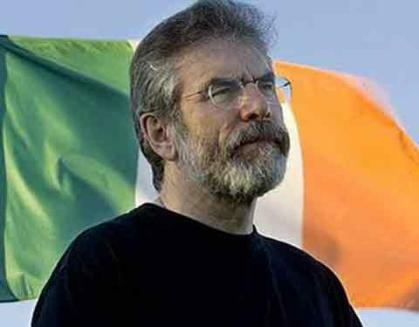 Irish republican political party Sinn Féin has released its Towards a United Ireland “discussion document” to renew debate about ending the nearly 100-year-old partition of Ireland. The party’s effort is spurred by the Brexit vote earlier this year. In the United States, the number of Irish and those of Irish descent numbers in the tens of millions and they enjoy significant political strength. … Many are openly supportive of a united Ireland. So, in any conversation about Irish reunification we need to involve the Irish Diaspora, to reach out to it and to marshal its political strength in support of our goals. More on reaction to the document in a later post. Evolving Ireland: This 1937 map shows the Irish Free State and Northern Ireland 16 years after partition. The Republic of Ireland was created from the Free State in 1948. This entry was posted in Northern Ireland, Politics and tagged Brexit, Sinn Féin, United Ireland on November 30, 2016 by admin. The northern state was a one party state which reinforced the institutionalised use of discrimination, sectarianism and segregation. …This [southern] state is the product of the counter-revolution that followed the Rising and of a dreadful civil war which tore out the heart at that time of what remained of the generosity of our national spirit. As the idealism of the aborted revolution waned a native conservative elite replaced the old English elite with little real change in the organisation of Irish society and no real movement towards a rights based dispensation. …Religion was hijacked by mean men who used the gospel not to empower but to control, and narrow moral codes were enforced to subvert the instinctive generosity of our people. Catholic, 2; Protestant, 2; British/English, 6; Ireland, 16; USA, 2; republic, 26; partition, 7; democracy/democratic, 11; religion, 1; Good Friday, 17; freedom, 1; justice, 3; equality, 17; fairness, 4; people, 14; politicians, 0; vote/s, 6; poll, 4; Sinn Féin, 11; Fianna Fail, 1; Fine Gael, 4; Labour, 4; unionist/unionism, 12; united Ireland, 2. The full speech is on the Sinn Féin website. News coverage in Irish Central included four pages of reader comments that cheer and disparage Adams. This entry was posted in Politics and tagged Gerry Adams, Good Friday, United Ireland on August 4, 2013 by admin. An unofficial poll in two Ireland/Northern Ireland border communities shows strong support for re-uniting the island, The Irish Times reports. Other media outlets such as the Irish Examiner, Irish Independent and BBC ignored the vote organized by the pro-republican United Ireland – You Decide campaign. The 92 percent “Yes” tally among 1,000 or so ballots appears at odds with historical polling on the issue. That said, it’s interesting to read the post-vote comments on the Facebook page of Protestants for a United Ireland. The Good Friday Agreement of 1998 provides a mechanism for such a border poll. Some unionists have suggested holding a referendum as a way of calling the bluff of republicans, since another provision requires waiting seven years before allowing a second poll. Six northeast counties were partitioned as Northern Ireland in 1922 as 26 southern counties achieved partial independence as the Irish Free State. Ireland is now at the beginning of a 10-year stretch of centennial anniversaries that are rekindling that history and debate. This entry was posted in Northern Ireland, Politics and tagged Gerry Adams, Good Friday Agreement, United Ireland on May 27, 2013 by admin.